In a move that has become common practice among Israeli settlers, a herd of wild pigs that was captured inside Israel was recently released in the Salfit district, leading to large-scale destruction of Palestinian crops.The boars ran rampant across Palestinian farms on Sunday, trampling crops in the Al-Matwi, Ash-Shala and An-Nejarah areas, according to local reports. The massive expansion of settlement in the area around Salfit has led the Palestinian district to be virtually surrounded by settlements. 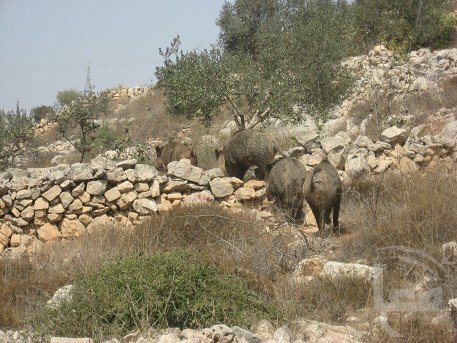 The settlements are all enclosed behind fences, and Israeli settlers often dump wild pigs and other wild animals outside of their gated settlements onto Palestinian land. The boar attack comes after a series of violent settler attacks against Palestinians in the area, including stone throwing, beatings and shooting. Also, Israeli settlers in the area have been dumping their sewage onto Palestinian village lands and farms over the last several months.